South Texas College staff and faculty took a moment to commemorate the conclusion of construction projects created as a result of the voter-approved 2013 bond program. A scrapbook was presented to trustees by STC President Dr. Shirley A. Reed at their regular board meeting on Jan. 30. 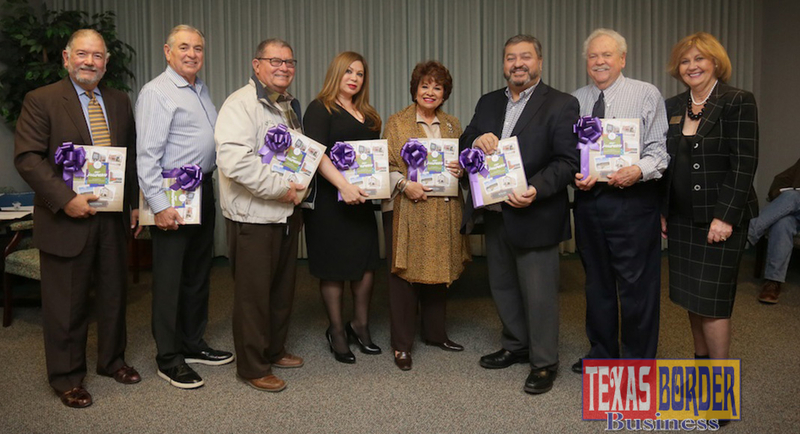 Left to right, Trustees Paul Rodriguez, Jesse Villarreal, Board Chair Dr. Alejo Salinas, Rose Benavidez, Vice Chair Graciela Farias, Roy De Leon, Gary Gurwitz, and STC President Dr. Shirley A. Reed. MCALLEN, TEXAS (Feb. 2, 2018 ) – South Texas College staff and faculty took a moment to commemorate the conclusion of construction projects created as a result of the voter-approved 2013 bond program. Public Relations staff at STC prepared a scrapbook commemorating the 2013 bond program. STC President Dr. Shirley A. Reed then presented the scrapbook to trustees at their regular board meeting on Jan. 30. South Texas College is seeing its campus construction projects come to light, made possible by the voter approved $159 million bond passed in 2013. Among its five campuses, South Texas College welcomes the expansion of new facilities designed to serve students for generations to come. The expansion will enable the college to accommodate its growing student enrollment, and demands for workforce development by local employers. After nearly five years, all of the facilities being constructed as a result of the bond have been completed or are nearly completed across STC’s five campuses. The college recently celebrated the opening of its new Technology Campus expansion in January, ushering in a new facility built with the assistance of industry in the Rio Grande Valley. Staff, faculty and administrators are ushering in a new era of change at STC. Construction projects at STC’s Pecan Campus include four new classroom and student activity facilities. The college constructed additional facilities and a full-scale renovation of the Library at the Mid Valley Campus. At STC’s Starr County Campus, a new Health Professions and Science Building will bring NAH resources to the area, as well as a new library and expansion of student services and student activities facilities. STC administrators now look ahead to the official opening of its expansion at its Nursing and Allied Health Campus in the month of February as well as the opening of the highly anticipated Regional Center for Public Safety Excellence by June 2018. “The journey has been long, the journey has been difficult; but the destination holds great rewards for many,” said STC Trustee and Vice-Chair Graciela Farias.